by Dr. Georg Kordis, Iconographer and lecturer at the school of Theology, University of Athens, Greece. Paper, read at the preparatory workshop at the Norwegian Institute in Athens, on Monday 7 th March 2005. Web edition: 12.05.2005. 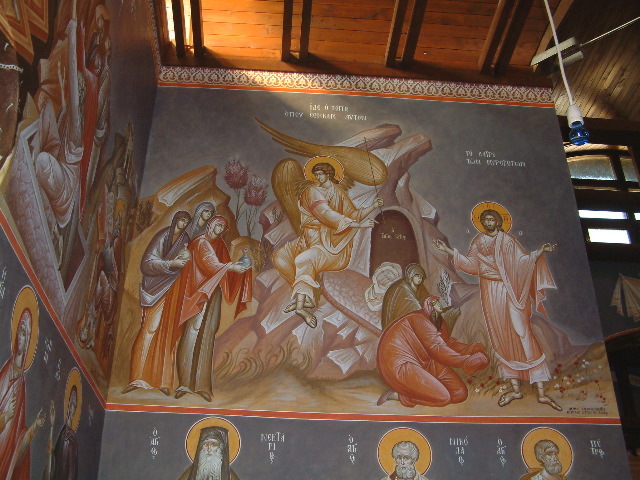 All illustrations are from the wall paintings by Georg Kordis in the Katholikon, namely the central church of a monastery, of the Convent of Mother of God, at Kleidi near Athens. They were executed 2003-2005, painted directly on the wall in the traditional technique of egg tempera. The paper presents Byzantine iconography and the function of icons in Orthodox religious life. Firstly, elementary features of the orthodox iconology are going to be presented in order for the function of icons to be theologically established. Then, the substantial role of icons in Orthodox ecclesiastical life is being described. I n the second part of the presentation exemplifies on the icons themselves, from a formal point of view, what has been theoretically presented. John 21,4seq. The wonderfull fish haul. 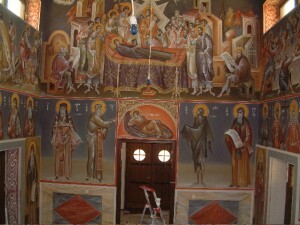 After iconoclasm, the conflict about the existence and function of icons, which took place during the 8th and 9th century, the Orthodox Church in the Seventh Ecumenical Council declared that the icon is a substantial element of the Faith and that use of icons in the Churches and private rooms is necessary condition for the maintenance of orthodoxy. The ≠ Ορος of the seventh ecumenical Council, based upon the patristic theology, confirmed in every detail the reasons for the use and prostration of icons and determined the framework for the artistic activity. The theology of the Fathers of the Church of the iconoclastic period constitutes the proper theoretical basis upon which the art of iconography was founded, and also constitutes the basis upon which the function the icon is based. The iconoclastic policy of the Byzantine emperor Leo III caused the outbreak of the controversy about icons and their function in the Church. This controversy lasted one and a half centuries and troubled the Eastern Church. The main issue of this controversy was neither the existence of the icons in the Churches and the function nor the prostration (proskynesis) of the images, which was one of the major problems, but not the basic one. During the second stage of the controversy, Constantine the V, called Copronymos by his iconophiles enemies, expressed the basic christological argument against the images and the ability of art to depict Christ, the son of God who acquired flesh and lived as a man. The main iconoclastic argument rejected the possibility of having a painted icon of Christ, since He participates in two different natures; the human and the Divine. The human nature, since it is sensible and visible, can be described and depicted, But the Divine nature, as inconceivable by the senses, is, therefore, cannot be depicted. Therefore, anyone who intends to draw the icon of Christ has to describe both His natures. Consequently, one falls into heresy by either dividing or blending the two natures. According to iconoclastic argument, idolatry was the natural result of the painter’s action. Since the Divine nature cannot be described and «embodied» in icons, the artistic product was nothing more than an idol; i.e. a simple form, which characterizes-indicates human nature but not the Divine one. Thus, everyone who prostrates this icon-idol falls into idolatry. The Orthodox answer to the iconoclastic accusations appeared slowly and gradually during the iconoclastic period by the holy Fathers of the Church. St. John Damascene was the first who responded to the early iconoclastic arguments. He declared that, after the Incarnation of Logos, Christians are permitted to have icons of Christ since He became true and complete as Man. Therefore, we can depict what we have seen, i.e. His fleshy and bodily form. This form, however, does not describe His deity. The Seventh Oecumenical Council of Nicaea II (787) reaffirmed this theology and declared that painters do not circumscribe either the human or divine nature. The action of painting does not separate the two natures of Christ, since the portrait of someone does not lead to the separation of his soul from his body. According to the Fathers of the Council, the icon is a mimesis of a prototype and corresponds to this in its form and the name written on it. The icon and the person depicted are correlated by these two elements. The Council, apart from its theological argument, founded the framework of the art of iconography. The icon, according to these decisions, is not an artistic product, but belongs to Church tradition, whereby the artist receives the forms of the items depicted. These forms-which are the essential element of the icons- belong to that tradition and are not derived from the artist ΄ s creativity. The artists, as it will be clarified later, do not create the forms; their contribution is limited to the artistic level. They offer their skills and they work according to the stable and unique principles of the art of painting. The reference of the Seventh Oecumenical Council to the sanctity of the icons and their endowed power is of special interest. The Fathers, in their effort to answer other such iconoclastic accusations, clarified that the so-called “sanctity” of Orthodox icons, is not provoked by a «magic» relationship to the prototypes. At an ontological level, the icon is absolutely separated from the prototype person depicted on it. The icon and the person depicted do not share the same essence at all. They are correlated by the koini omoiwsis; they just share the same external form. Only in this way is it possible to understand the proper meaning of the sanctity of the icon. Since the external form of a person has been impressed on the icon, it becomes part of the prototype. Because of this, the icon ΄ s prostration is legitimate and, according to the Fathers (e.g. St. Basil), it is transferred to the prototype. 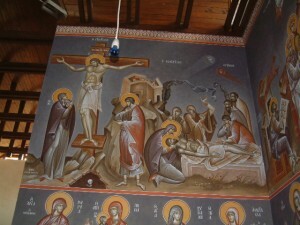 The distinction between the true prostration before the icons and the adoration of God is one of the most important points of the patristic iconology. It clarifies that prostration has nothing in common with idolatry, since the faithful adore neither the material of the icon nor the person depicted. Therefore, God is the only adorable reality and not the saints of the Church. They are not small gods. They participate in God ΄ s energies but they are not gods. Thus, we prostrate before them, but we do not adore them. The faithful respect the holy icons, which are a legitimate means for Christians to reach the prototypes and establish a kind of relationship to them. The Fathers of the Seventh Oecumenical Council did not, however, responded to the iconoclastic argument in every detail. They did not reach the depth of their arguments and, more specifically, they did not clarify how a bodily appearance, a flesh like form, could illustrate the theandric person of Christ, at the same time avoiding the description of His natures. They underlined the truth that the natures are not depicted able and that Christians repaint the external form of Christ, through which he was seen during His earthly life, but they did not demonstrate in theological terms the relationship between this external form and the prototype. Half a century later St. Theodore the Studite, was the theologian who assumed the task of presenting a complete expression of the Orthodox iconology. The wise monk, who lived many years in exile because of his iconophile beliefs, did not present a new theology on the issue of the icons, separate from the theology of the Seventh Oecumenical Council. In his writings he revealed the same truth, but he elucidated specific aspects of the whole issue, which had not been deeply elaborated by the previous theologians. Actually, he tried to continue and enrich the traditional iconology of the Church. The iconoclastic christological argument was always the starting point of his theology. The iconoclasts during the ninth century (813), after a short interval, tried to reinforce their attacks against the icons and the depiction of Christ. And, of course, they continued to reject the depiction of Christ. They could not accept that a bodily form was capable of describing and illustrating the two natures of the Incarnated Logos. They also denied the Orthodox distinction between the graphi (painting) and describing (perigraphi), proposed by St. Nicephorus, patriarch of Constantinople. The Iconoclasts insisted on demanding the circumscription of the two natures of Christ as a sine qua non condition for His depiction. Consequently, St. Theodore had to respond to these accusations and find the way to explicitly confine the limits of depiction. His effort was founded on a basic distinction between the ousia – nature and hypostasis made by the Fathers of 4th centuries (Basil, Gregory of Ν yssa). He asserted that things which share the same essence differ from each other by their unique mode of existence. This mode has specific characteristics, idioms. The total of these idioms constitute the hypostasis, i.e. the way of existence of a nature. According to St. Theodore, Christ is one hypostasis but He participates in two different natures, the human and the Divine. Actually, with reference to the Orthodox tradition, the human nature assumed in the pre-existed hypostasis of the Logos, the second person of the Holy Trinity. Thus, Christ is a unique hypostasis having human and divine idioms, and consequently, He is visible in His unique, external form of Jesus of Nazareth. Later the abovementioned St. Theodore approaches the issue of depiction. When we attempt to portray someone, he insists, a human hypostasis for example, actually we reproduce the idioms, the unique characteristics by which he is differentiated from all the others. In the case of Christ, the depiction is not directed to His natures at all. The painter is unable to describe Christ by the means of his art, since colours and lines are improper to define the substantial characteristics of both human and Divine natures. Therefore, the painter illustrates His hypostasis; he presents his personal idioms, and more specifically the visible element of His Hypostasis, i.e. the form of His face. This element constitutes the icon of Christ without describing His natures. The form of Christ ΄ s face depicts Him because it is the element that makes visible His Hypostasis. This form shows that Christ existed but it does not express His natures. The form, which is a personal-hypostatic idiom, does not correspond to nature at all. And, of course, this is valid for all the other idioms. In this way, St Theodore, proved that the external form of Christ depicts Him, yet simultaneously it does not describe His natures. In other words, the Father of the Church declared that the depiction is not a description but an indication of the Hypostasis. The icon ekfainei (â κφαίνει ), indicates the person and it does not circumscribe his essence. The theology of St. Theodore Studite responded to the iconoclastic argumentation and gave the final formulation to the Orthodox iconology. At the same time, unwittingly, he solved a great aesthetical problem, which has distressed the ancient Greek world and probably the whole western civilization for centuries; the relationship between the form and content in works of art. Before the appearance of Orthodox iconology, the artist, in order to create an icon, had to describe the nature of the item depicted. He was obliged to reach the essence and to make it visible and sensible. In other words, the painter was the icon ΄ s creator. He was the one who was responsible for giving form to an abstract content. This artistic reality totally changed after the expression of Orthodox Iconology. A person, and any other being, was not considered to be impossible to depict. Since nature does not exist in an abstract condition but always in hypostases, the consideration of the art of painting has changed. The nature cannot be depicted and is no longer the subject of the art of painting, which focuses on hypostasis, a specific mode of existence. This mode is already depicted since it has its own form. A hypostasis, according to St. Theodore is always depicted, from the moment of its birth. That ΄ s why the great iconologist of the Orthodox Church declared that Christ was born as depicted. Finally, according the aforementioned theory, the artist does not create the icon of a being. He receives the forms of things and he repaints them (anazwgrafei), he reproduces the external forms, which are the total of someone ΄ s personal characteristics. Thus, the art after iconoclasm acquires different characteristics and surpasses the problems of the pre-iconoclastic era. Because of this, art becomes less creative in the field of forms and extends its interests to the field of communication. The post-iconoclastic art of painting focuses on inventing technical means in order to achieve a better and real relationship between the beholder of the image and the world depicted in it. We can talk about a new age in the art of iconography, characterized by a social functionality of the icon. 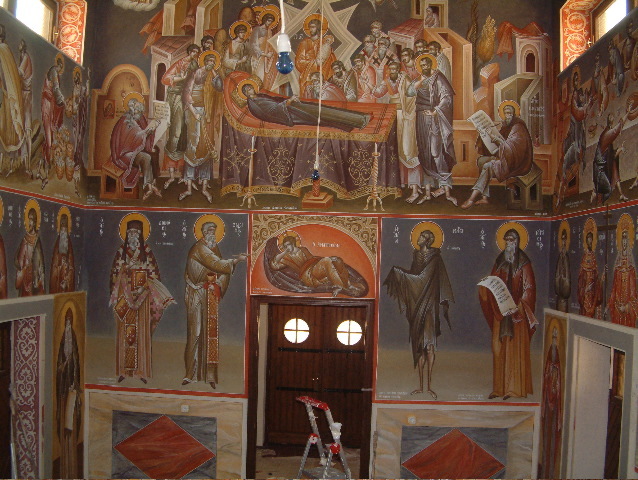 Dormition of the blessed Virgin. The function of the icon in orthodox religious life, which, as already mentioned, based on the patristic theology, is a complex phenomenon, since the icon is simultaneously an artistic object. With this data the character of art of iconography should be determined in order for the role of painted icons in orthodox religious life to be clarified. St. Fotius was the patriarch of Constantinople who favoured the reappearance of Iconography in the Churches of the capital after Iconoclasm. Occasionally he wrote a few thoughts about the art of iconography, in order to confront the last iconoclastic voices, which were still survived in the capital of the Eastern Roman Empire after the triumph of the iconophile party. In this way, he bequeathed to us a very important definition on the art of iconography and its framework. According to this, the art of icon painting is not an invention of the iconographers but a tradition of the Oecumenical and apostolic Church. The painter does not invent the forms of the sacred icons, which belong to the Church tradition, whereby he receives and impresses them on the iconismata (artistic icons). The sacred art of painting, based on its own principles, follows the apostolic tradition and is enlightened by the Holy Spirit. In this way, the art accomplishes its mission, which, according to the saint father of the Church, is double; the proper elaboration of the forms of the saints depicted and the proper presentation of them to the beholder. St. Fotius gives us important and useful information about the Byzantine consideration of the art of painting. His witness is quite valuable since it is unique and comes from the post-iconoclastic period, in which interest about the art of painting was intense and correlated to the Christian dogma. According to Photius ΄ theory, the primary and basic goal of art is the maintenance of the forms of the saints depicted. Painters, elaborating the forms, should not distort them and make them non-recognisable to the beholder. The artists have to purify the forms of the saints depicted by removing all the elements which do not have an ecclesiastic purpose. These elements, coming from human curiosity, reduce the functionality of the icon. This purification of the icon is the first and the primary task of the painter. Simultaneously, he has the task of seeking the proper painting mode, in order to present the form of the saints and event depicted. This style should have special and specific characteristics because of the holiness of the persons depicted in the icon. St. Fotius asserts that the painting mode should be ieroprepeis (suitable to the sanctity). After the abovementioned, we can conclude that in the mind of Byzantines, during the post-iconoclastic period, the artificial icon was considered to be a complex reality, composed of two elements; the form of the person depicted and the painting mode. The form (morphi) is the substantial element of the icon since it is a unique hypostatic idiom. Therefore, it can not be changed by anyone. It is the stable element of the icon and it has no history. After the iconoclastic period all the forms of the saints stabilized and remained unaltered throughout the centuries. This stabilization of the forms is not always comprehensible to the scholars of the Byzantine art and it is interpreted, either as an expression of decadent art, or as an intervention of the ecclesiastical authorities in the field of art. In my opinion, this phenomenon derives from the Orthodox Iconology and is founded upon the real relationship between form and the hypostasis of the person depicted. The form is not an artistic and imaginary result. So, any alteration of it, could affect the relationship between the image and the prototype. Therefore, the stabilization of the forms has theological reason. The second element of the icon is the painting mode. This element is not substantial since it is a language through which the artist presents the icon-form. As a mode, the painting element can be changed. A survey of Byzantine art of the iconoclastic period, immediately points out that the evolution of the painting mode is continuous. Actually, what we call the history of Byzantine painting is nothing other than the history of the painting mode, the evolution of the artistic solutions invented by the painters over the centuries. The icons of Christ, of Theotokos and of all the other saints, are always the same. The element that differentiates one from the other is a specific style, a new painting mode. With these data it is not difficult to understand the evolution of Byzantine art through the centuries and to give a satisfactory answer to the questions which follow the modern interpretation of the Orthodox iconography. Therefore, we can explain: a) the stability of the iconography (forms) and the simultaneous evolution of the style, b) the indiscreet use of the painting mode for both religious and secular themes by the Byzantine artists, c) the fact that it is possible to have a miraculous icon which is not rendered in the «proper» Byzantine style. Following this, our interpretive proposal is a safe theological base upon which the creative relationship to the Byzantine tradition could be supported. Since the painting mode does not substantiate the icon, but it is a secondary element, the icon does not depend on it. Therefore, the lack of or the change in it does not influence the authenticity of the icon. The form is the only substantial element and it is by itself the icon of the person depicted. Matthew 28, 1-10: The women at the empty grave above a row of male saints. This is the most difficult and probably the most important part of our presentation, because in this context we will try to explain the very reason for the Byzantine painting system; the reason for the artistic solutions of this style, which actually exp l ains the function of the icon in the Orthodox community . Many scholars of Byzantine iconography frequently try to understand the reasons for the choices of the Byzantine iconographer with reference to the hidden theological meaning. Therefore, they conclude that the Byzantine painting is a specific expressionism of the middle ages; i.e. a painting language through which the painter expresses theological truth by distorting the normal form of the subject depicted. The Byzantine artistic vocabulary is nothing more than a code of signs pointing to hidden meanings. However, this interpretation cannot explain the choice of the Byzantine artist to paint in this specific manner and organize the painting surface, following stable principles. In my opinion, we have to seek the reason for the Byzantine painting in its functionality and the role of icons in the Christian community. First of all we suggest a few basic presuppositions for the proper interpretation of this painting mode. Byzantine iconography has been developed in order to serve the Christian community and not only as an individual expression of the painters. The Church building was always the centre of Christian worship, the place where Christians gathered in order to communicate with God. This building from the 6 th century on became the visible expression of the Ecclesia, i.e. the relationship between Man and God, and received the name Church. Therefore, the building-Church demonstrates, in visible and sensible forms, the Orthodox meaning of the Church; the real and hypostatic union between man and God in the person of Christ. Every architectural compartment of the Building has its theological meaning, quite comprehensible by the Byzantine society of this time. After the 6 th century the cross-in-square church with a dome prevailed, in order to visualize the aforementioned meanings. In this architectural rhythm the rectangular shape of the Church signifies the earth, the created world (ktistos kosmos), and the dome indicates Heaven, i.e. the uncreated reality of God. The cross, which is shaped in the rectangular of the main church, signifies the Crucifixion and the Martyrdom of Jesus Christ, which resulted in mankind being redeemed from Sin. The loading of the compartments of the Church with specific theological meaning affected the iconographical programme and the repertory of the icons. Therefore, Christ, the revealed Son of God who assumed the human nature, occupied the centre of the Dome-heaven. Angels and other heavenly Strengths used to surround Almighty Christ. In the drum of the dome painters used to depict prophets of the Old Testament, because they pronounced the Incarnation of God ΄ s Son. In the triangle shaped areas under the dome, the four Evangelists are depicted since they were the men who described the events of His earthly life; they testified to the truth of the Incarnation, the Crucifixion and the resurrection of Jesus Christ. In the niche of the apse, the icon of Theotokos platytera prevails as a depiction. She holds in her arms the infant Christ and demonstrates the truth of the incarnation, i. e. the hypostatic union between Man and God. On the walls of the main church –the rectangular that signifies the earth- the events of the life of Christ are depicted. In the lower zone, close to the congregation, the saints of the Church are presented in frontal position in order to communicate to the spectators and to guide them in their spiritual life. The basic iconographic programme of the Orthodox Church, as it was formed after the iconoclastic controversy, is a visible manifestation of the conception that the church is the body of Christ in which the believers are embodied. The Eucharistic realism of the Orthodox Church is, in my opinion, the very reason for the Byzantine painting mode. As it is already been mentioned, the idea that the church is the invisible body of Christ, explains the imagery of the Christian church, but it does not give an interpretation to the painting mode. Thus, we have to seek its reason in the Orthodox conception about the holy Liturgy and more specifically in the way the Orthodox people use to understand the Holy Communion. St. Ignatius, Bishop of Antiochia in Asia Minor and disciple of St. John the theologian, gives us in his Epistles a testimony on the realistic understanding of the Eucharistia (Holy Communion). He asserts that there is a real change of bread and wine offered by Christians to God as signs of their whole life. The Holy Spirit, the third person of the Trinity, after the epiklesis of the priest, comes to the Holy Gifts and changes them to the Flesh and Blood of Christ, without changing their essence. Actually as, it will be clarified later (14 th century) by St. Gregory Palamas, Bishop of Thessaloniki, the aktistes (uncreated) energies of God change the Gifts and so the Holy Communion is not identified with the essence of God. In this context we have to keep in mind that, for Orthodox Christians, God is coming to the Congregation (Synaxi) and accomplishes the communion between Man and God. God comes to man, therefore there is a movement from the transcendental reality to the earthly reality. Yet, if we would like to translate this movement in terms of time, we would say that God comes to our time. He comes to the present; He “invades” our life, our dimensions of time and space. Of course, this ‘invasion’ is not strange and unusual in the Christian theological tradition, since the accurate distinction between the uncreated reality of God and His creation, leads inevitably in the revelation of God. Since Man can not reach the reality of God – because of his weakness and his limitation- God “invades” the reality of Man and reveals the Truth in terms comprehensible to the humankind. Later, it is not difficult to find the reference point of the Orthodox iconography, and to correctly interpret the development of the Byzantine painting mode. This reference point is not behind the image, but in front of it. The Byzantine painter does not seek to create a separate, a distinct iconic “reality”, in which the depicted things exist. Thus, he acts in a very different way in comparison to the western renaissance painter, whose purpose is to create an objective image; an image which stands opposite the spectator and has its own dimensions of time and space. The effort of the western artist after the Renaissance focuses on giving the beholder the illusion that the picture is a different reality. With this data, he uses a specific perspective to draw the things depicted and handles the colour in a specific manner. So, he manages to create the illusion of an autonomous pictorial space and actually he destroys the unifying communion between the image and the beholder. The objectivity of the icon was the main goal of art during and after the Renaissance period. And, of course, it was considered to be the major virtue of the work of art. Today the estimation about illusionism and its functionality has changed. Many western artists from the 19 th century onwards, disputed the value of this objectivity in the field of art and pointed out its anti-artistic consequences. In this context, we do not intend to analyze this issue extensively, as our purpose is to describe the formation of Byzantine painting system. Byzantine artists did not pursue the creation of a separate pictorial reality and that is why their icons have no depth. This lack of autonomous pictorial space should not be interpreted as a result of their weakness and ignorance. On the contrary, in my opinion, Byzantine artists did not seek the autonomy of the icon from the beholder because, through painting, they pursued the opposite. They tried to unify the two different realities, i.e. the iconic and the real. Thus, instead of placing the objects depicted into the depth of the painting, they bring these forward to the reality of the beholder; they extended the image to invade the dimensions of the beholder. That is why in Byzantine painting, the image is neither remote, nor immobile, nor stacked on the surface of a wall or wood. The artistic form is activated and has motion towards the spectator and its reality. As we have already mentioned this invasion of the image into human reality is not accidental and random. It follows the theology of the Church and it results from the Eucharistic realism of the Church. Since God and His world invades our reality, since He comes to the present (time and space) the saints depicted have to follow this movement. Thus the images have to move toward our present . Following this basic principle, Byzantine artists created an entire painting system, which is in full accordance with the abovementioned theory about pictorial space and the relationship between the image and the beholder. Thus, since there is no room for pictorial depth, the image is extended to the real space of the Church and moves towards the spectator. For that reason, the things depicted are drawn in a strange perspective, which, by many scholars, is usually called inverted perspective. In this drawing mode the subjects seem as if they are falling towards the beholder. Therefore, the roofs of the houses or the top of the mountains can be seen. In my opinion, this kind of perspective is a natural result of the endeavour of the Byzantine artist to bring the subject depicted to the dimensions of the beholder. That is why we propose the term “relative perspective” to define the function of this drawing system. Things are depicted in this mode in order to come closer to the beholder and give him the chance to communicate with them. Crucifixion and Entombment above a row of female saints. Orthodox iconography, as opposed to western iconic (virtual) reality, invented the real iconicity; created a painting world which is not false and illusory, but which is real since it participates in our real world and exists in our dimensions. According to the aforementioned, we can speak about the iconographic realism which characterizes Orthodox iconography. And more specifically we can speak about aConsolatory Realism. I propose this term in order to define the limits, the function and the character of Orthodox iconography. And I intend to analyze it in order to explain its dimensions and meanings. First of all, Byzantine Orthodox iconography is realistic because it depicts the specific (hypostasis-prosopon) and not the general and abstract of nature-essence. Secondly, this art is realistic because it aims to bring things depicted to the present and does not call the spectator to escape into a different reality. Therefore, this art does not cultivate the illusion and the abandonment of the only existing world. We can say, that Byzantine iconography, avoiding illusionism, helps people maintain their relationship with the reality and to stay here and confront the difficulties of life. This kind of realism, which characterizes the whole neo-hellenic civilization, consoles people, not by the abandonment of reality, but by its enrichment with the qualities of God΄s Kingdom. Byzantine iconography is not an invitation to a trip to the other, remote and transcendental world where “paradise” exists; on the contrary, it brings to our reality the qualities of the transcendental world and thus enriches it. In this way, the art of iconography provides strength in our life and makes lighter the burden of the every day “cross”. Following this, we could say that Orthodox iconography has a healing function, referring to the relationship between man and his environment. There is a third reason for calling Orthodox iconography realistic and consoling. As it has been mentioned, through his art the artist brings to our reality the things depicted. But, what exactly does he bring to us? And more specifically, what are the qualities of the transcendental world carried by the depicted saints to us? And, of course, in which mode does the artist achieve his goal? We have to respond to all these questions in order to clarify our interpretive proposal. First of all, in this context, we have to emphasize that the Byzantine artist attempted to make the images and their qualities ( α¨σθητές ) sensible to the beholder and the congregation in general. The term α¨σθητές here has a specific meaning which does not coincide with the comprehensible; rather it is correlated to the whole human being and not only to the mind. Thus, when Byzantine artists tried to make something sensible, it had to be passed through the human senses, and more specifically through sight. The qualities of the transcendental world should be transformed, in order to become a real experience. The idea was not enough for the Byzantine people since it had no real character and it was abstract. With this data, Byzantines artists tried to make sensible the qualities of the Heavenly Kingdom and render them in terms of the art of painting; they made the supernatural qualities not only visible through signs but they made them tangible and sensible to both body and soul. The main “instrument” for this purpose was rhythm, an artistic quality already known to Byzantines from ancient Greek art, where it mainly served the interaction between the different compartments of the painted or sculptured image. As professor Christos Karouzos pointed out years ago, the Greeks discovered rhythm in order to organize the motion in a work of art. Since they abandoned the motionless Egyptian statue and tried to give motion (significant of life) to their images, they had to handle this motion very carefully. Motion is significant to life but simultaneously it indicates the temporary, and consequently the vanity and senselessness of life. The value of life lies in its eternity, a quality indicated through motionless. Thus, they had to give motion to things depicted and, at the same time, to refute it. Under these conditions they reached the conception of rhythm, which is the “wedding” of motion and motionless, the coexistence of change and stability. Rhythm is the stable element in a motion. Therefore, they managed to achieve a wonderful result characterized by motion (life) and motionless (eternity). The synopsis of these two contradictory idioms lead to a paradox: the phenomenon of an eternal moment. In Greek language this paradox is described by the word “ νÜν ” . At the aesthetical level, rhythm affects the human senses and creates an impression of life and at the same time gives an impression of eternity. It produces a dynamic balance which is equivalent to eternal life. And, in psychological terms, rhythm gives the spectator the sensation of a living serenity, a peaceful life. After this it is not difficult to understand why the Byzantine orthodox artist had chosen rhythm in order to manipulate the painting forces of the icon and transfer to the beholder the qualities of the heavenly kingdom. The anonymous artisan of the eastern middle ages had to try to make sensible the qualities of eternal life, where the saints of the Church live. Peace and serenity, gladness and calmness and above all the unity of everything are the characteristics of the Kingdom of God. All these characteristics should be rendered in the painting mode in order to be sensible to the beholder. Painters received from the tradition of the Church the theme and the forms of persons together with facts of the Holy History. Their duty was limited to the proper presentation of these forms. They had to elaborate the forms and to organize the painting synthesis in a proper manner in order to demonstrate the abovementioned qualities. Thus, they had to re-synthesize the form of the subject because in a natural form, everything is in unruly and irregular. So, the natural form was analyzed in its basic elements and after it was re-synthesized in a new way, in order for to be achieved the proper rhythm. This process is very complicated and it will not be discussed here. However, it is, actually, a distancing from naturalism and illusionism. The artist no longer, seeks to make paintings resemble the prototype; he does not attempt to produce its illusionary substitute. The painting no longer has as its primary goal the mimesis, the accurate reproduction of the form of things depicted. The art of painting in the Byzantine era changed its role and function pursuing the transportation of spiritual qualities through painting qualities. Therefore, through the rhythm achieved, the qualities of the spiritual world are conveyed to the spectator. A) Τhe icon is the true and real f or m of the person depicted, it is the perfect confirmation of its existence. 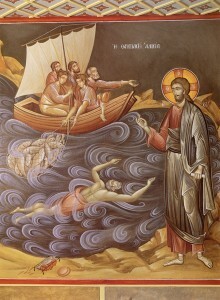 The icons give perfect testimony to the reality of Christian history and life. B) The icon as an artistic object has also a special function and a substantial contribution to spiritual life of the faithful. Thus, mainly by using rhythm, the icon becomes a real channel through which the iconic reality comes to the present and invades the space and time of the spectators in order to convey and communicate qualities of the heavenly Kingdome to the faithful beholder. In this way the icon is not a symbolic reminder of the past, but a useful means for past and future to be brought together in the present. This is the real reason for the use of icons in the Orthodox religious life.